• Wide frequency range from 1MHz to 125MHz. • Quick delivery of samples and short lead time by mass production. 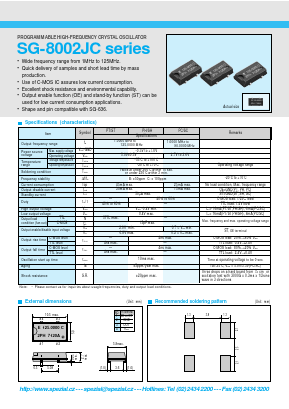 • Use of C-MOS IC assures low current consumption. • Output enable function (OE) and stand-by function (ST) can be used for low current consumption applications. • Shape and pin compatible with SG-636.